Town hall • A sympathetic crowd helps the GOP congressman feel at home and defends him as detractors try to interrupt. Leah Hogsten | The Salt Lake Tribune Rep. Chris Stewart, U.S. Representative for the 2nd District of Utah, answers questions from his constituents during a town hall, Friday, May 12, 2017 at Richfield High School. Leah Hogsten | The Salt Lake Tribune l-r Terry Thompson of Monroe and Woody Farnsworth of Richfield attended the meeting with Rep. Chris Stewart to show their support. Rep. Stewart, U.S. Representative for the 2nd District of Utah, held a town hall Friday, May 12, 2017 at Richfield High School. Leah Hogsten | The Salt Lake Tribune l-r Richfield resident Sandy Caruso argues with St. George resident Brett Menzie who argued aloud through a megaphone that Stewart needed to answer more than the seven questions fielded. Rep. Chris Stewart, U.S. Representative for the 2nd District of Utah, held a town hall Friday, May 12, 2017 at Richfield High School. Leah Hogsten | The Salt Lake Tribune Reactions from the crowd as Rep. Chris Stewart, U.S. Representative for the 2nd District of Utah, answers questions from his constituents during a town hall, Friday, May 12, 2017 at Richfield High School. Leah Hogsten | The Salt Lake Tribune Rep. Chris Stewart, U.S. Representative for the 2nd District of Utah, answers questions from his constituents during a town hall, Friday, May 12, 2017 at Richfield High School. Leah Hogsten | The Salt Lake Tribune l-r Kellie Henderson and friend Rebecca Smith from Salt Lake City get into a spirited discussion with R. K. Nielson of Monroe about coal power versus clean energy after Rep. Chris Stewart's town hall. Rep. Stewart, U.S. Representative for the 2nd District of Utah, answered questions from his constituents, Friday, May 12, 2017 at Richfield High School. 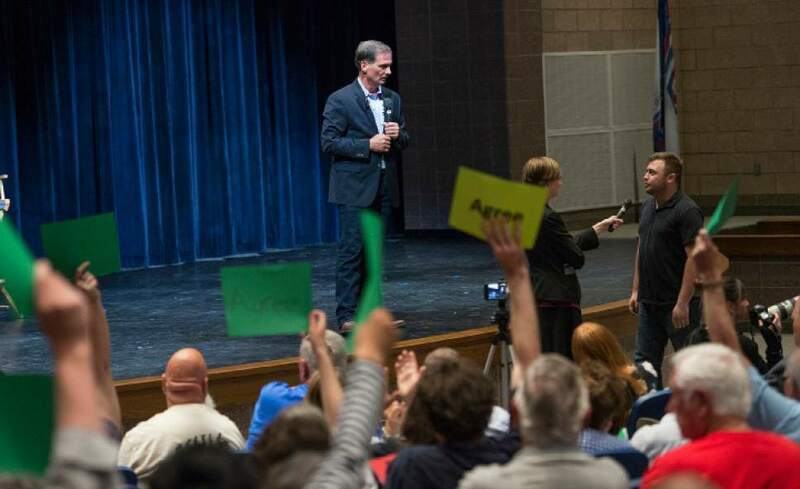 Leah Hogsten | The Salt Lake Tribune Reactions from the crowd as Rep. Chris Stewart, U.S. Representative for the 2nd District of Utah, answers questions from his constituents during a town hall, Friday, May 12, 2017 at Richfield High School. 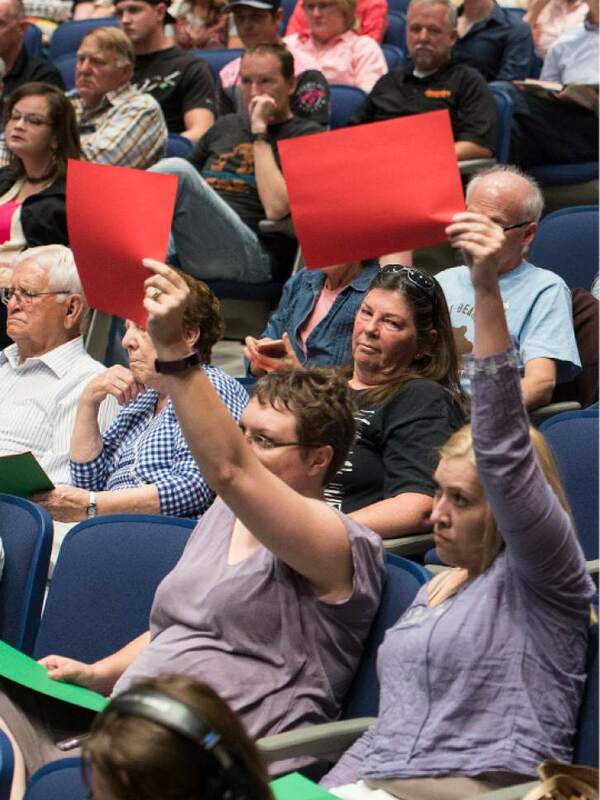 Leah Hogsten | The Salt Lake Tribune Reactions from the crowd as Rep. Chris Stewart, U.S. Representative for the 2nd District of Utah, answers questions from his constituents during a town hall, Friday, May 12, 2017 at Richfield High School. Leah Hogsten | The Salt Lake Tribune Rep. Chris Stewart, U.S. Representative for the 2nd District of Utah, answers questions from his constituents during a town hall, Friday, May 12, 2017 at Richfield High School. 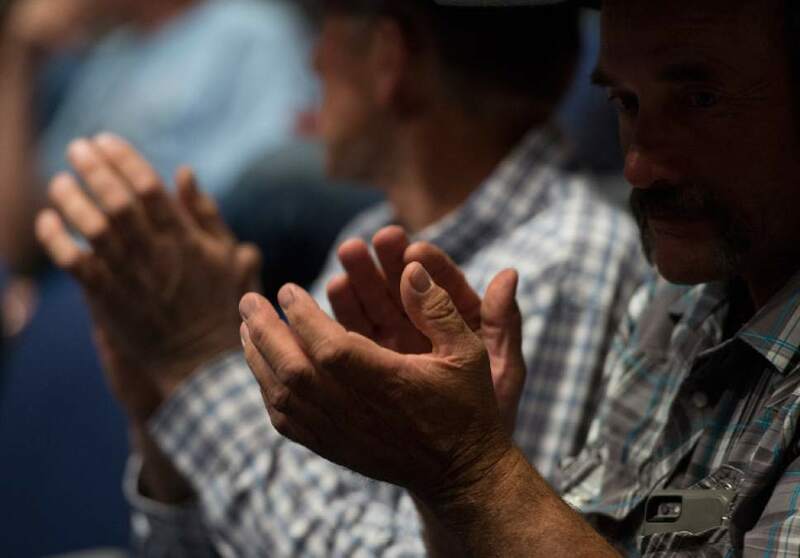 Leah Hogsten | The Salt Lake Tribune Several Sevier County ranchers were in attendance. Rep. Chris Stewart, U.S. Representative for the 2nd District of Utah, answers questions from his constituents during a town hall, Friday, May 12, 2017 at Richfield High School. 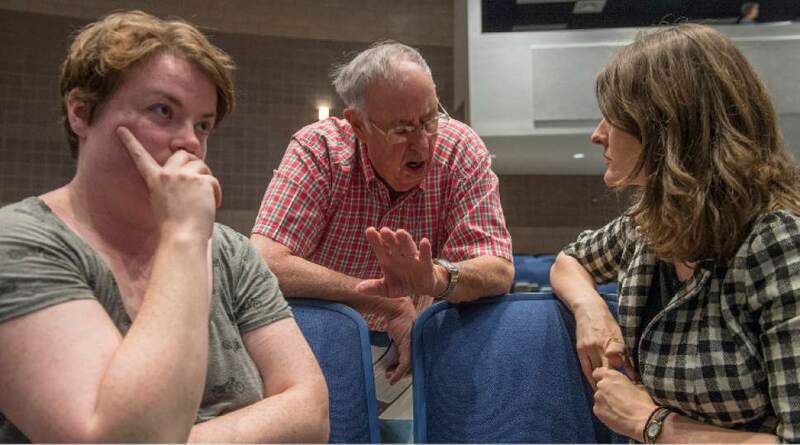 Leah Hogsten | The Salt Lake Tribune Richfield residents argue with St. George resident Brett Menzie, left, who argued aloud through a megaphone that Stewart needed to answer more than the seven questions he fielded. Rep. Chris Stewart, U.S. Representative for the 2nd District of Utah, held a town hall Friday, May 12, 2017 at Richfield High School. Leah Hogsten | The Salt Lake Tribune l-r Terry Thompson of Monroe and Woody Farnsworth of Richfield attended the meeting with Rep. Chris Stewart to show their support. Rep. Stewart, U.S. Representative for the 2nd District of Utah, held a town hall Friday, May 12, 2017 at Richfield High School. 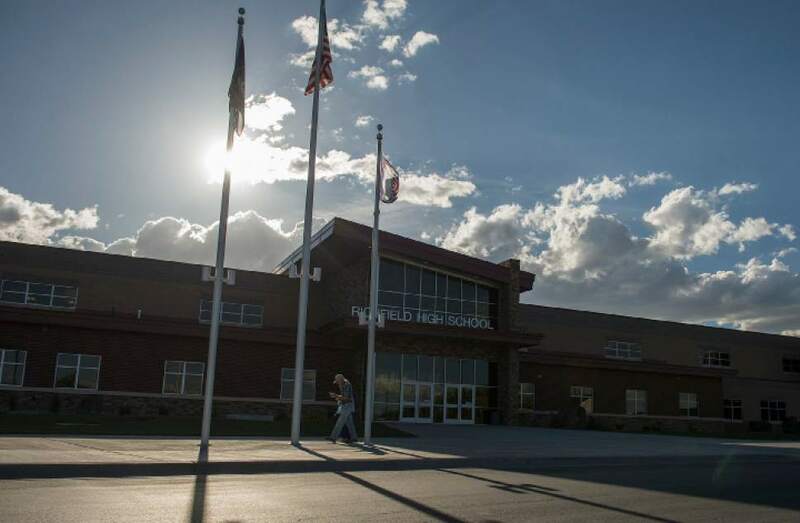 Leah Hogsten | The Salt Lake Tribune A crowd of about 300 people attended U.S. Representative for the 2nd District Chris Stewart's, town hall Friday, May 12, 2017 at Richfield High School. 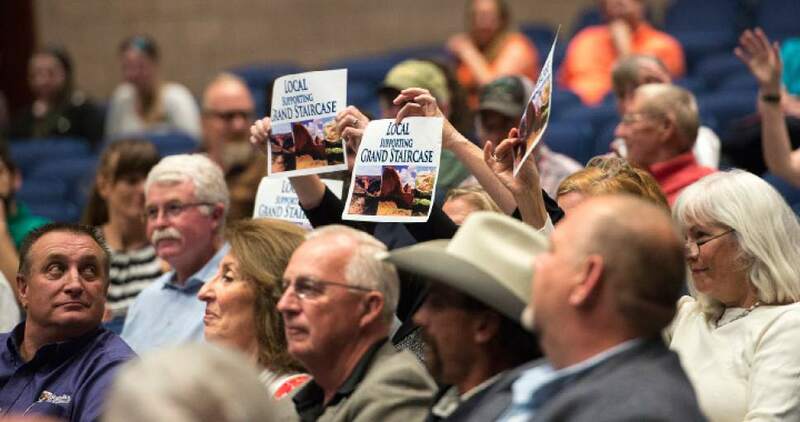 Leah Hogsten | The Salt Lake Tribune Several Sevier County ranchers were in attendance. Rep. Chris Stewart, U.S. Representative for the 2nd District of Utah, answers questions from his constituents during a town hall, Friday, May 12, 2017 at Richfield High School. Leah Hogsten | The Salt Lake Tribune Rep. Chris Stewart, U.S. Representative for the 2nd District of Utah, answers questions from his constituents during a town hall, Friday, May 12, 2017 at Richfield High School. 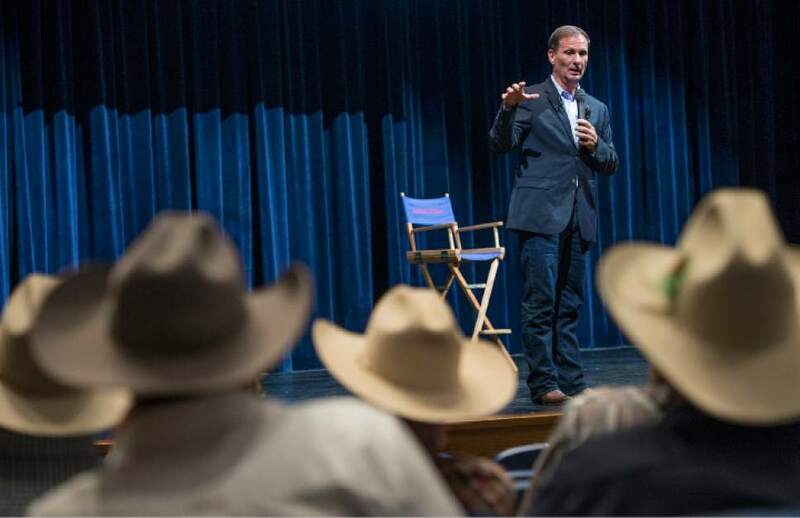 Richfield • Deep in Utah&apos;s Republican country, about 160 miles from Salt Lake City, GOP Rep. Chris Stewart met a crowd of 300 people who supported and defended him. They cut him off midsentence only to applaud and cheer his statements. They clapped when he took the stage and when he left it. And they squashed opposition from the handful of detractors in the audience by yelling back  "Let him talk" and, "Who paid you to come?" The congressman spent 15 minutes at the beginning of his town hall Friday night championing his recent vote to repeal and replace Obamacare. 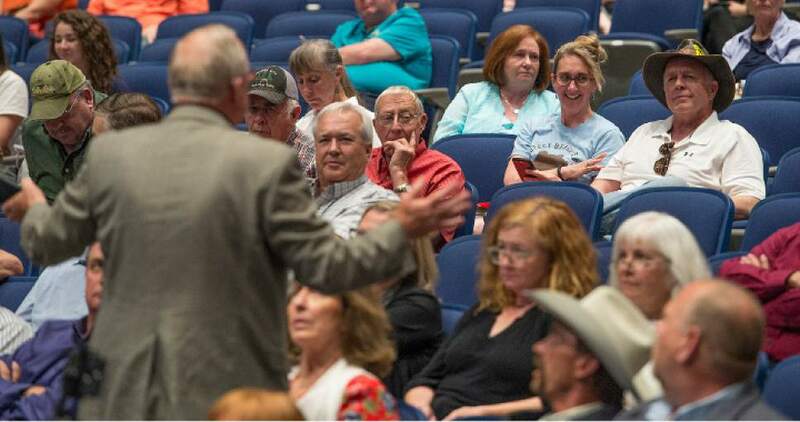 He then answered seven questions  selected randomly from constituents who indicated that they wanted to speak  over 40 minutes, most coming from residents of rural Sevier County. Stewart received thank-yous and tips of cowboy hats for his responses. The sympathetic scene offered a stark contrast to the congressman&apos;s raucous town hall in Salt Lake City on March 31. 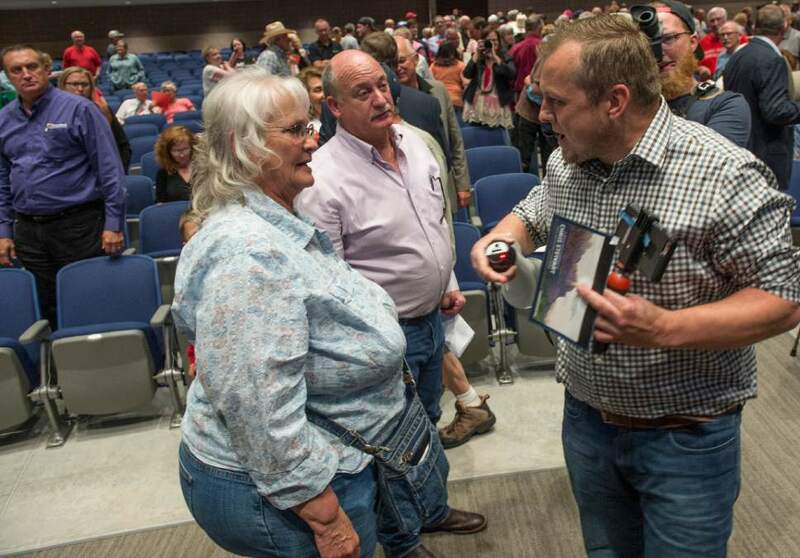 At that event, 1,000 audience members, mostly Democrats and members of Utah&apos;s growing "resistance" movement, shouted at Stewart to "do your job" and repeatedly yelled over his answers. They booed as he addressed the GOP health care plan, and they demanded to know about possible collusion between Russia and President Donald Trump&apos;s administration. 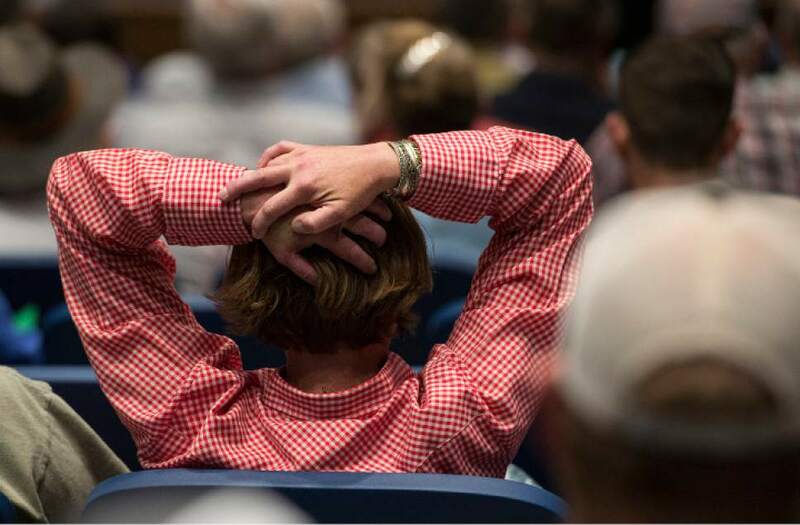 Friday&apos;s crowd in central Utah asked less combative questions: How can Republicans remain united as a party? How can the federal government help local communities? How will the Trump administration bolster coal mining? Stewart is a part of the House Intelligence Committee&apos;s investigation of Russia&apos;s meddling in the 2016 presidential election. The congressman faced just one question related to that work. Tyrell Aagard, a Salt Lake City resident, asked the congressman whether he could "defend the firing" of FBI Director James Comey, who was investigating possible collusion between Trump&apos;s campaign and Russia. The president dismissed Comey on Tuesday. The representative has avoided extended comment on the subject this week  only wishing the law enforcement head well  but he added Friday that Comey "lost the confidence of people on both sides of the aisle." Stewart also insisted, as he has before, that there is "no evidence" to show connection between Trump&apos;s campaign and foreign interests. "If you&apos;re banking on that, you may be disappointed," he said. He received support from most of the audience in that response. 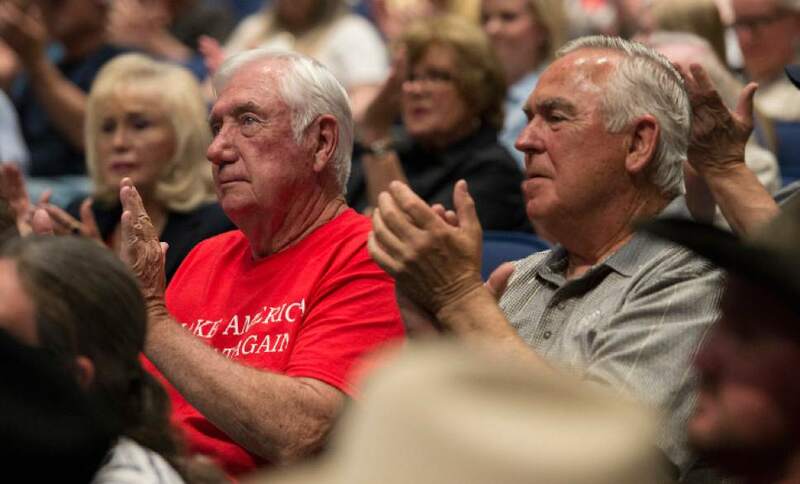 Terry Thompson, 77, of Monroe, supports Trump&apos;s decisions in office and wore a Make America Great Again T-shirt. "Do I think Comey should&apos;ve been fired?" Thompson said. "Hell yes." Trump&apos;s account of the firing, though  that he was thinking about the probe related to Russia  diverged from White House officials&apos; statements that the president acted on recommendations from the attorney general and deputy attorney general and based his decision on how Comey handled an investigation into Hillary Clinton&apos;s emails. 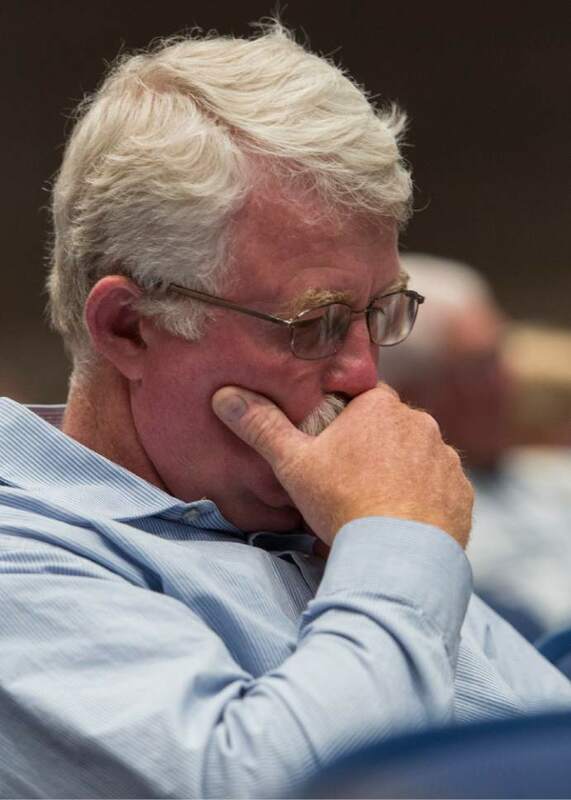 Stewart  whose sprawling 2nd Congressional District includes Salt Lake City and stretches from southern Davis County to St. George  is the first member of Utah&apos;s all-Republican delegation to hold a town hall after the House passed its health care bill last month. The state&apos;s four representatives favored the Republican plan, the American Health Care Act, to overhaul Obamacare. Stewart voted for the new bill and has said it "will drive down costs [and] offer families more choices." Still, he said, "You can&apos;t be denied coverage under this plan." When a vote was delayed on the bill on March 24, Stewart said it was "the most discouraged I&apos;ve felt in Congress." He describes the House-passed legislation as fulfilling a promise he made to Utahns. "It doesn&apos;t save me anything," he said, adjusting his camouflage baseball hat. "I wish [Stewart] would get rid of it." His gathering Friday marks his second since Rep. Jason Chaffetz&apos;s hostile town hall in February. At Chaffetz&apos;s event, in which 1,000 people were allowed inside and 1,500 stood outside, barred from entering because of fire codes, the crowd demanded that the congressman "explain yourself." 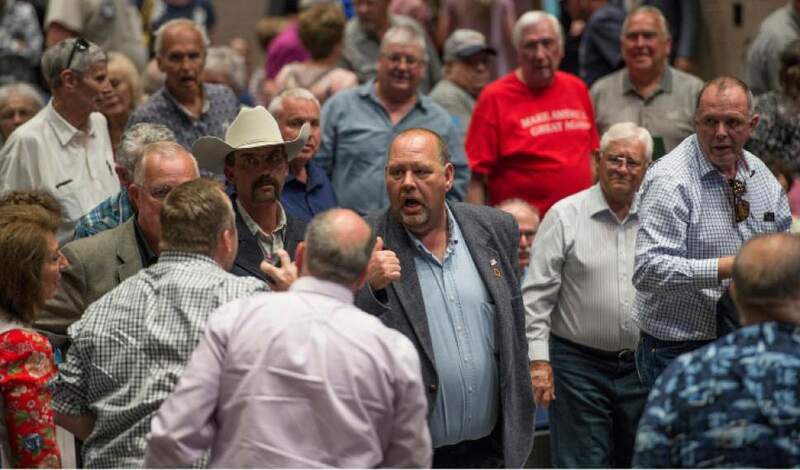 After that, Utah Republican Party Chairman James Evans said the town hall was "violent" and unsafe; he warned representatives to skip live forums to avoid harassment  though police and Chaffetz did not make the same assessment. Evans also denounced the audience at Stewart&apos;s March event, saying it was "more disrespectful than anything." Besides Chaffetz and Stewart, no other member of Utah&apos;s all-Republican congressional delegation has held an in-person town hall this year. Joanne Slotnik, co-founder of the Salt Lake Indivisible "resistance" movement, drove three hours to Richfield on Friday to encourage Stewart to stop "being invisible" and stand up for what&apos;s right. "On lands issues, he&apos;s been doing just what Utahns want," Talbot added, wearing a cowboy hat and carrying a bottle of Coca-Cola. A few in the audience, though, wore "Protect Bears Ears" T-shirts and had "Protect Wild Utah" stickers.